CHICAGO (January 28, 2019) - In its 34th year of honoring the nation's best high school athletes, The Gatorade Company, today announced Karlee Hoffman of Daviess County High School as its 2018-19 Gatorade Kentucky Girls Cross Country Runner of the Year. 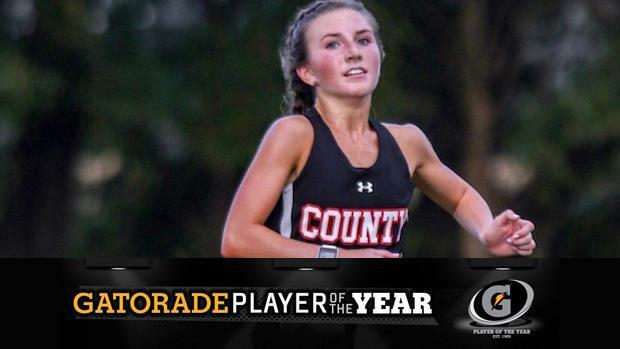 Hoffman is the second Gatorade Kentucky Girls Cross Country Runner of the Year to be chosen from Daviess County High School. The award, which recognizes not only outstanding athletic excellence, but also high standards of academic achievement and exemplary character demonstrated on and off the racecourse, distinguishes Hoffman as Kentucky's best high school girls cross country runner. Now a finalist for the prestigious Gatorade National Girls Cross Country Runner of the Year award to be announced in February, Hoffman joins an elite alumni association of past state award-winners in 12 sports, including Lukas Verzbicas (2010-11, 2009-10 Carl Sandburg High School, Orland Park, Ill.), Megan Goethals (2009-10, Rochester High School, Rochester Hills, Mich.), Jordan Hasay (2008-09, Mission College Preparatory Catholic High School, San Luis Obispo, Calif.) and Chris Derrick (2007-08, Neuqua Valley High School, Naperville, Ill.). The 5-foot-2 senior took second at the Class AAA state meet this past season with a time of 18:56.08, leading the Panthers to a secondplace finish as a team. Hoffman also broke the tape at the Owensboro City-County Cross Country Meet by more than a minute this past fall. A four-time First Team All-State selection with four top-five finishes at the state meet, she clocked the fastest all-class high school time at the state meet (eighth-grader Ciara O'Shea won the AAA state title) and was the fastest Kentucky runner in seven of 10 races she entered this past fall. Hoffman has volunteered locally with the Council for Exceptional Children, which advocates for children with disabilities and their families. She has also donated her time to multiple community service initiatives through her church's youth group. "The conditions [at the state meet] were terrible, but Karlee excelled, and I think that has a lot to do with her training," said Whitney Matthews, head coach of Apollo High School. "She trains hard and pushed the girls around her to be better runners." Hoffman has maintained a weighted 3.96 GPA in the classroom. She has signed a National Letter of Intent to compete in cross country and track and field on scholarship at Eastern Kentucky University this fall. Hoffman joins Gatorade Kentucky Girls Cross Country Runners of the Year Kaitlyn Lacy (2017-18, Louisville Male High School), Michaela Reinhart (2016-17 & 2015-16, Lexington Catholic High School), Gabriella Karas (2014-15, Martha Layne Collins High School), and Whitney O'Bryan (2013-14, Daviess County High School) as athletes who have won the cross country award since its inception in 2007. As a part of Gatorade's cause marketing platform "Play it Forward," Hoffman has the opportunity to award a $1,000 grant to a local or national youth sports organization of her choosing. She is also eligible to submit an essay to win one of twelve $10,000 spotlight grants for the organization of choice, which will be announced throughout the year. Karlee took third place at the 2018 Oldham County Haunted Wood Classic and reflected on the end of the season state meet preparations.